ok, one more before i head out to find new curtain rods...these shots belong to artist sarajo frieden. 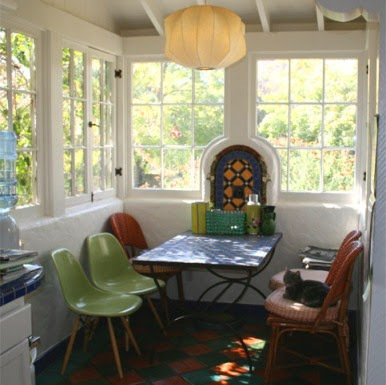 i love her porch and the collection of vintage chairs combined with the beautiful tile work. and the tree painting? such a nice idea in contrast to the marigold walls. Absolutely love the tree design, very fresh and original and great contrast to the vibrant orange. Love this one, too! Both rooms are great. I'd like to see more, especially that picture wall. And check out that paper lamp collection! I would love this at my house with my nice plaster walls. Orange is one of my favorite colors, but I would also like this on an aqua background! Has anyone else noticed the high percentage of cats in these sneak peaks. Is there some kind of design/cat symbiosis? 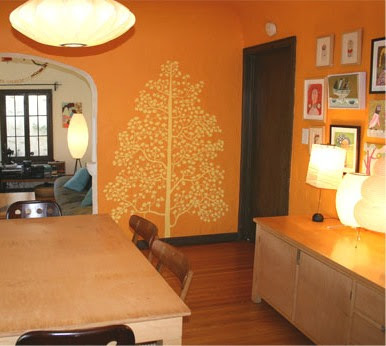 The layout of both rooms is super cozy - how could you not love that tree? Bright walls like that can sometimes be really overbearing, but the use of wall space here is brilliant! I love her work and her home is beautiful too! this blog is great ! i love seeing trees painted on walls! i would looove to see more of this house! it looks so interesting. Unfortunately I am not a fan of the pumpkin color usually, but it seems to compliment the furniture and hardwood floors i guess? I love the wall colour and the tree painting so much. There's a very warm homey atmosphere.